Kevin grew up in the city of Compton, California, during a time when civil rights and neighborhood self-help organizations were on a rise. It was also a time of struggle which was evident by a war which was raging between the Black Panther Party, The United Slaves Organization, and the FBI. During this time, Kevin had envisioned himself being a Black Panther, but his dreams were cut short by the activities of COINTLPRO, an F.B.I. counterintelligence program designed to disrupt and discredit domestic groups of the 70s. In 1972, Kevin officially joined the Crips after the death of an admired comrade. His involvement with the Crips took him on a journey of self-destruction. Several times during his young life he found himself incarcerated in the juvenile system. In 1987, after traveling from state to state proliferating gang violence and selling drugs, the doors of freedom finally closed on him. He was sentenced to more years than he could count for drug sales, attempted assaults, burglary, and other hideous crimes, but in September 2002, Kevin was released from prison in the State of Oregon. After Kevin’s release from prison he returned to California where he attended California State University, Dominquez Hills. 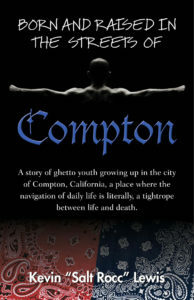 He earned his bachelor degree in Sociology, and moved to the State of Kansas in an effort to separate himself from the gangs and drugs that still permeated and overwhelmed the city of Compton, California. Before leaving Oregon, Kevin worked with several organizations dealing with the problem of gangs. In August 1993, Kevin Lewis appeared on the front cover of the Sojourners Magazineattending the Urban Gang Peace Summit held in Kansas City. This summit was a nationwide call to peace and gang members and leaders from 26 cities converged on Kansas City calling for an end to gang violence. Kevin now resides in Kansas, with his wife, Chasity, who has been a big inspiration in his life and his continued driving force for positive change.